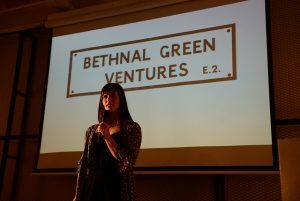 Please wish a warm welcome to our new General Manager Vicky-Marie Gibbons, who starts with us at Bethnal Green Ventures today! Vicky will be our General Manager, leading the operational management of our programmes and assisting with the development of our community of ‘Tech For Good’ founders and investors. Vicky comes to us from Participle as the assistant to the principle partner, where she was responsible for ensuring a smooth day to day running of the office. This was where Vicky discovered her passion for start ups, and using design to improve society and the enviroment. Vicky is really excited to be joining the team, and is looking forward to meeting all of the applicants for the summer 2014 cohort.